Fuzzball & Scuzzball - Arrow Attack! 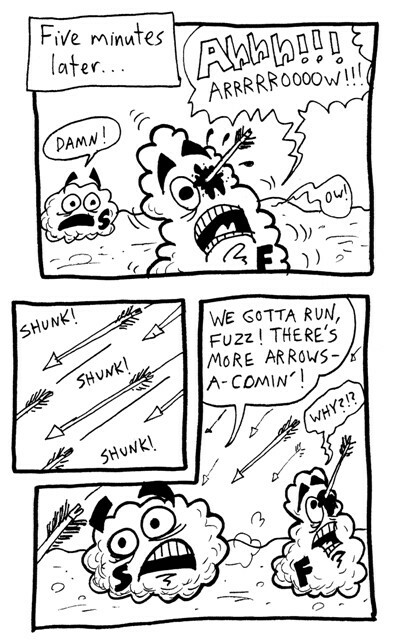 Comic 12 - Arrow Attack! After D.F. 's last panel on the previous page, I couldn't resist doing this. I like the sound effect: Shunk! Shunk! Shunk! At the time I was thinking of this cover: http://www.comics.org/issue/36912/cover/4/ Not that, you know, you can really tell from the artwork. This is page 12, so we're now halfway through the story. D.F. and I did not confer about story details, but I did mention when we reached the one-quarter, one-third, and halfway points. We wanted to make sure to pace ourselves accordingly so we didn't have to rush at the end. Did we succeed? Keep watching! I KNEW it was that Daredevil cover you were referring to! Either my CFAT is strong or you and I occupy a chillingly familiar plane of mindspace together.